The Andean nation’s next leader will have to embrace fiscal discipline, make a troubled peace accord work and overcome anger at corruption among the powerful – plus oil and drugs. Neither likely winner of Sunday’s first-round election looks to have all the tools needed to cope. 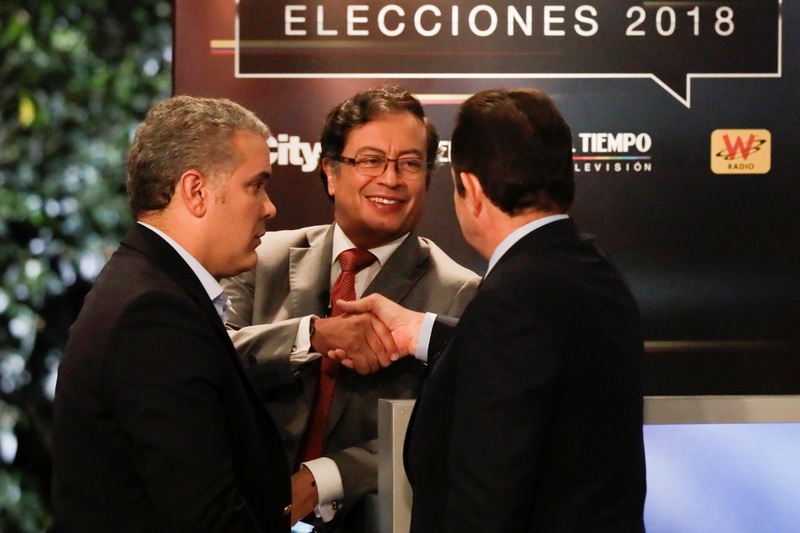 Colombian presidential candidates Gustavo Petro and German Vargas Lleras shake hands next to Ivan Duque, during a presidential debate at El Tiempo newspaper in Bogota, Colombia, May 24, 2018. Colombians vote on May 27 in a presidential election. If no candidate wins more than 50 percent, a second round will be held on June 17.